Made in Altadis USA's Tabacalera de García S.A.S. factory with the likes of Romeo y Julieta and the world renowned H. Upmann and Montecristo labels, the Casa de Garcia is a great handmade cigar for the money and a welcome addition to Altadis' classic portfolio of brands. The Casa de Garcia Connecticut (bundle on left) is a mild, smooth and creamy cigar with a Connecticut Shade wrapper covering Connecticut binder and Dominican/Honduran long fillers. 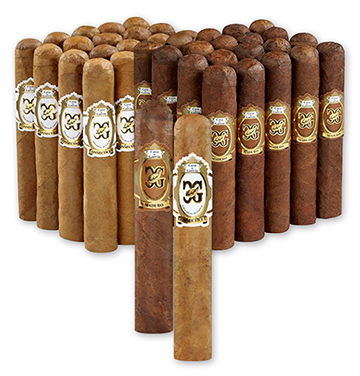 Casa de Garcia Maduro cigars (bundle on right) offer a medium-bodied, robust smoke with natural sweetness and feature a Connecticut Broadleaf wrapper and binder over a blend of Dominican and Honduran long fillers. Please note that Casa de Garcia cigar bands are being updated and during this transition period you may receive cigars with bands different from what is shown in the image at right. The company assures us the blends remain the same.